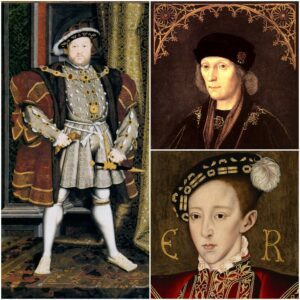 Today, 28th January, is the anniversary of the birth of King Henry VII in 1457, the death of his son, King Henry VIII, in 1547, and the accession of his son, Edward, as King Edward VI. You can read more about the death of Henry VIII at Whitehall Palace on 28th January 1547 and the accession of his nine-year-old son in my article 28 January 1547 – The King is dead! Long live the King!. And you can read more about the birth of the Tudor dynasty’s founder, King Henry VII, in 1457 at Pembroke Castle in my article 28 January 1457 – Birth of Henry VII at Pembroke Castle. You can also find out about these three Tudor kings in the following 60-second history videos I made about them. They just give the basics of their lives and reigns, but I hope you enjoy them. How weird that Henry Viii should die on his father’s birthday, 90 years later. Mind you Elizabeth of York died on her own birthday, so perhaps not so weird. Rest in peace, King Henry Viii. Love him or hate him, Henry was an enigma and certainly a man and King worthy of study and debate and perhaps one of the main reasons a lot of people first study history. He is a King who literally put his stamp on most parts of England and Wales and changed the country forever by his controversial annulment of his first marriage and his break from Rome. He was a builder and a destroyer, a much married monarch, the real founder of the navy and naval colleges, he both invested and protected English manufacturing and particularly industrial development to make canon and weapons, the wool trade and our own alternative for paper and raw materials, but he also debased the coinage towards the end of his reign as his war with France had caused economic problems, he built magnificent palaces while stripping the lead of Abbey churches, he was full of contradictions, both generous and ruthless, a great athlete for so many years before his legs restricted him, he was interested in everything, literally, he sponsored medical science and scholarship, but closed monastic establishments, bringing education under state control, his libraries rescued many works which would have been made by monks for years while pensioning off the monks who illuminated them and he was a man who wanted to know and control everything. His early years saw him as a knight and gallant, he brought the best scholars and artists, scientists and architects to his court, made it the place to be, full of new learning as well as splendid fun, but his later years saw him turn darker, cruel, inpatient, intolerant, vengeful, destroying wives and friends and unable to brook opposition or criticism. There are a thousand reasons for his changes and scholarship has tried to understand Henry from original sources, medical theories or examination of what records we can interpret, from neurological to psychological explanations, theories about his blood or genetics, his religious and political changes, life events, to his reaction to a long and bitter divorce, the increase in his power to him just been plain bad or nuts. Maybe one thing fits, more likely many do, but really we will probably never really get to the bottom of Henry Viii because he was just himself. It is impossible to fully understand him or anyone from a distance of 500 years but that is the beauty of the debate he left behind him. As we can see the 28th January was a significant date in the Tudor calender, the birth of Henry V11 and the death of Henry V111, and the accession of the boy King Edward V1, a startling coincidence but that can happen in families, it’s true Henry V111 can interest people in Tudor history, his larger than life portrait where he stares out at us legs astride, his eyes piercing blue holds the viewer captive for several minutes, I find myself glancing at him and turning back, his huge face with the red beard and massive shoulders enhanced with his brightly jewelled doublet somehow epitomises that of a wife hungry tyrant, he has the kind of face that has greed and avarice stamped on it, Charles Dickens described him as a King with the Humpty Dumpty face of nightmare, that rings true and I know what he meant, he also described him as a blot of grease and stain on the history of England, one other historian whose name I cannot remember called him a hero, it’s very much up for debate whether he was a hero or a monster, he’s very difficult to define as he did do some things as Bq mentions that have been up for debate since his death, he did found the navy it’s true and he is rightly called its father, he did build some marvellous palaces, at the same time he did ruin some beautiful monasteries and cause homelessness for the poor and sick who sought those places as their refuge, he founded a new church which survives to this day and we can call that an achievement, but he did nearly cause civil war because of it by his actions to split from Rome, it was cataclysmic at the time and divided the country, although in his heart he was Catholic still he was all for reform as it gave him the chance to do what he wanted, absolute power, he was really an absolute monarch after the break from Rome and that’s when he really became known as a tyrant, his son the serious minded Edward V1 was fanatical about reform abhorring Catholism and so while we can see the Tudor monarchs were very colourful it was also an age of strife and religious intolerance, Edward had a brilliant mind, today we would assess his iq as possibly being that of a genius, his death before he reached his maturity and was able to rule alone was tragic and England lost a rare Jewel, perhaps one of the brightest she has ever owned, whilst his father Henry V111 was a prince of the Renaissance and excelled in music poetry and languages, he could read Latin and was interested in astronomy and great art, he did not possess the gifted mind of his son, but he was still very cultured and talented, he also was a great sportsman and was said in his day to ride so hard he could tire out nine horses, he was also a keen tennis player and his weathered racquet can be seen at Hampton Court today, he indulged in football and loved the joust which nearly cost him his life on several occasions, he embodied all what a king should be as he was handsome athletic and gifted, over six feet tall with golden red hair, a fresh clear complexion and a carefree friendly generous nature, he was popular and loved by his subjects, he seems to have resembled his mothers family the beautiful serene Elizabeth of York, who died when he was very young, her father Edward 1V was also loved for his genial nature and handsome face but he had a dark side too, when thwarted he could be quite murderous, a sinister trait something which his grandson inherited, yet he was not meant to be king, that glory was reserved for his elder brother whose sudden unexpected death placed Henry in the path to the throne, Arthur named after England’s legendary King was meant for greatness and his death devastated his parents, he left a young frightened widow left at the mercy of her parents in law and from then on Henry was schooled to be his father’s heir, when we see the portraits of Henry V11 he seems to fade into insignificance beside his golden son, though when young Henry V11 was said to be handsome with fair hair, his death mask and portraits show a narrow bony face with high cheekbones like his mother Margaret Beaufort, his clothing is sombre more like a churchman than a king and he seems to have a furtive look in the eyes, in contrast Henry looked and dressed like a King his huge codpiece too declared to the world his virility, the sad thing was it was all a show, after six marriages all he had to show for his matrimonial adventures were two daughters neither of whom were particularly robust, and one little boy who sadly died before his time, he too left a country divided when he ignored his father’s will and drew up what he titled his devise for the succession, it ended with his elder sister having to fight for her throne and his young cousin and husband having their blood shed, hardly what he had in mind and he severely underrated and so did his council and Dudley, that his sister would fight for what she believed was her birthright, Henry V11 is known as the victor of Bosworth and the founder of the Tudor dynasty, Henry V111 for being the King who married six times and had two of his wives decapitated, those actions really are what people remember him by, Rome comes second and the dissolution of the monasteries, something which would cause him unrest, as he would not want his memory tarnished by the blood of his wives, but we cannot choose how history judges us, that is something he has no control over, Edward V1 is remembered for his zeal for reform and leaving Lady Jane Grey his crown, in all the Tudor Kings were each remarkable in their own way although very sadly time was not on Edwards side and I think had he lived as long as his father he would have been a King to be proud of.